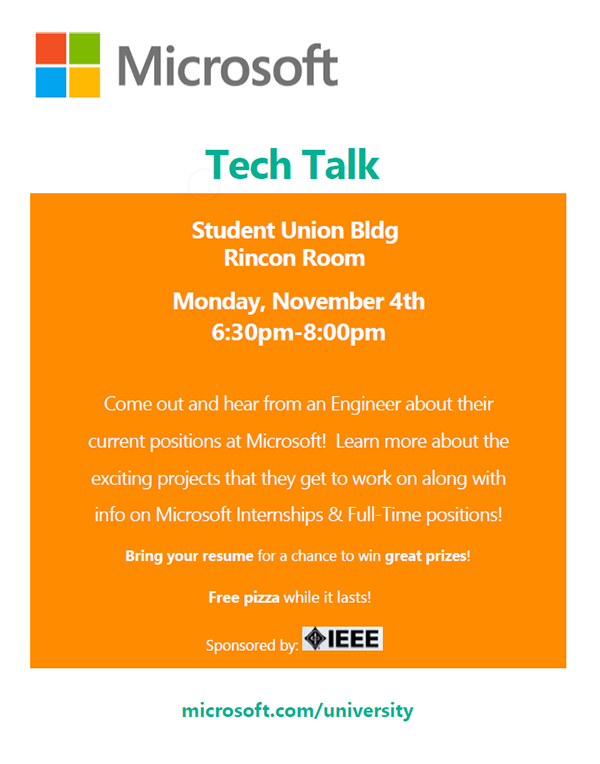 U of Az IEEE Student Branch: Microsoft Tech Talk next Month! Microsoft Tech Talk next Month! The IEEE Club has coordinated a tech talk with Microsoft engineers next month! Come for the free food and prizes, and learn more about what it's like to work for Microsoft. The tech talk will be on Monday, November 4th from 6:30pm to 8:00pm at the Rincon Room, which is on the 3rd floor of the Student Union Memorial Center. We'll send out more reminders about the event as we get closer to the date.